We keep our promises! Here are JobTestPrep's sample questions for the Canadian graduate Recruitment Test (GRT), followed by answers and detailed explanations. JobTestPrep offers free samples of practice tests. With them, you can get a feel for what our resources contain and familiarize yourself with your upcoming tests’ format. 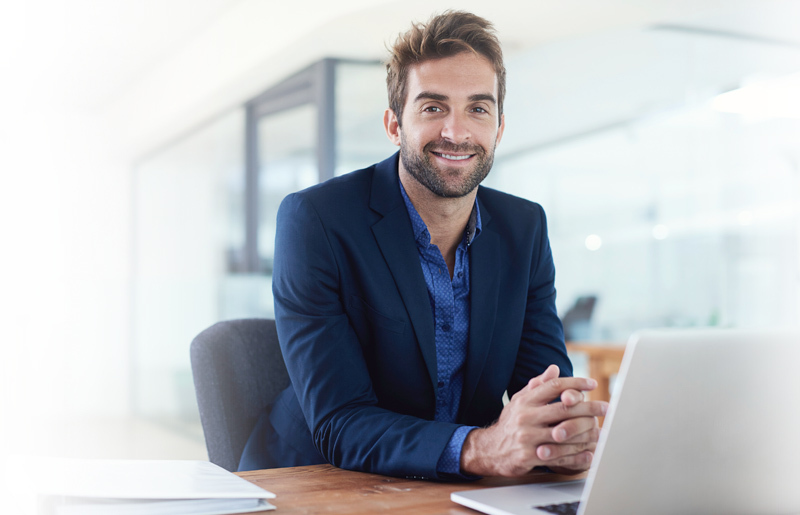 Yet if you want a firm guarantee that you will pass your pre-employment exams, you need to possess a deeper knowledge of the subject and develop your cognitive skills further. We can give you access to more preparation materials that will bring your practicing to a new level. Invest in our exclusive PrepPack™ and make your success on examination certain. 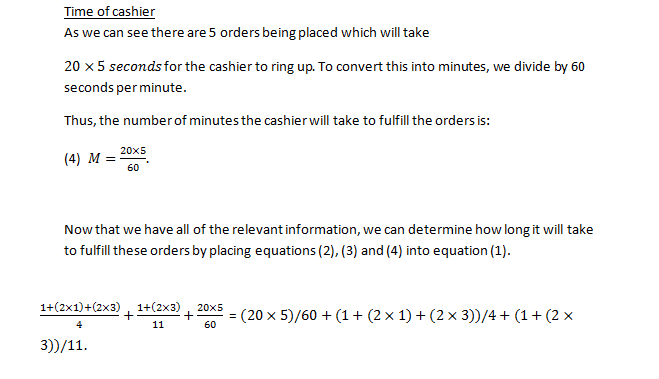 Instructions: Each number series question presents a series of numbers that you must complete by adding a new number. Find the rule which has been used to make up the series and apply this rule to complete the series correctly. 8, 24, 12, 36, 18, 54, ? 7, 35, 105, 105 ? For the arithmetic questions, your task is to determine the formula for solving a problem and then to choose the correct formula among the five proposed. A raffle is being held between Jane, Jenna and June whose ratio of tickets is 4:2:1 respectively. 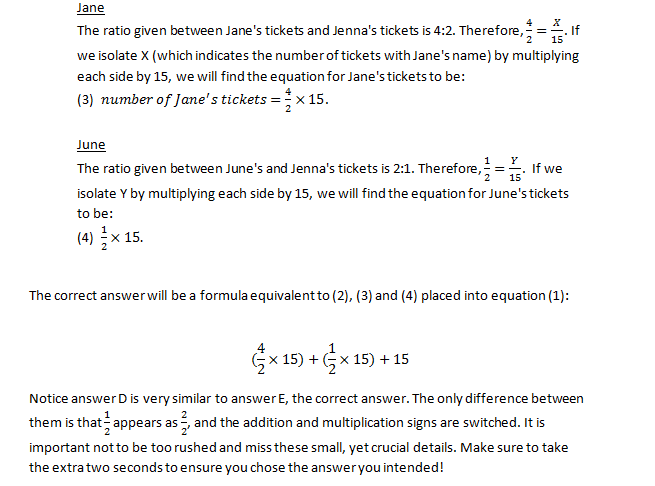 If 15 tickets have Jenna's name on them, which formula can be used to determine how many tickets there are in total? An espresso machine can make 4 cups of cappuccino or 11 espresso shots in a minute and it takes the cashier an additional 20 seconds to ring up each customer. 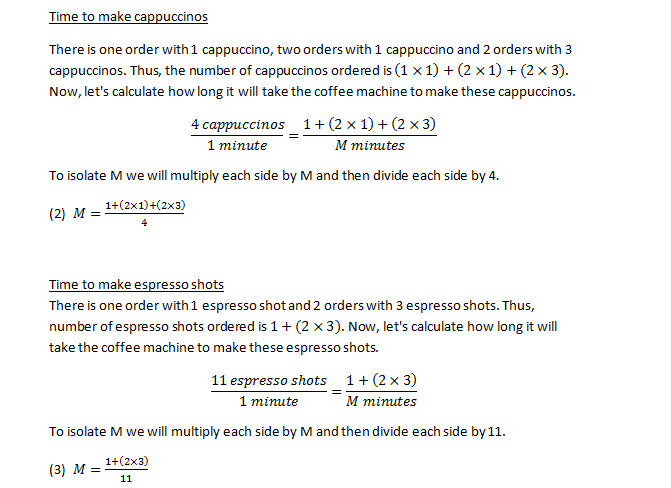 Which formula can be used to calculate how many minutes it will take to fulfill an order of 1 cappuccino and 1 espresso shot, 2 orders of 1 cappuccino, and 2 orders of 3 espresso shots and 3 cappuccinos? In each similarity question, five pairs of words are given. Your task is to select from among them the pair that refers most directly to a single more general concept. Each member of the pair should be an example of this concept. Our recommendation to approaching such questions is to find the most direct definition to both words in a pair. For example, in the pair CUCUMBER - CELERY, both words can be defined as ,"green vegetables." If we are given the pair GUITAR - VIOLIN, we can define both words as, "instruments with strings." 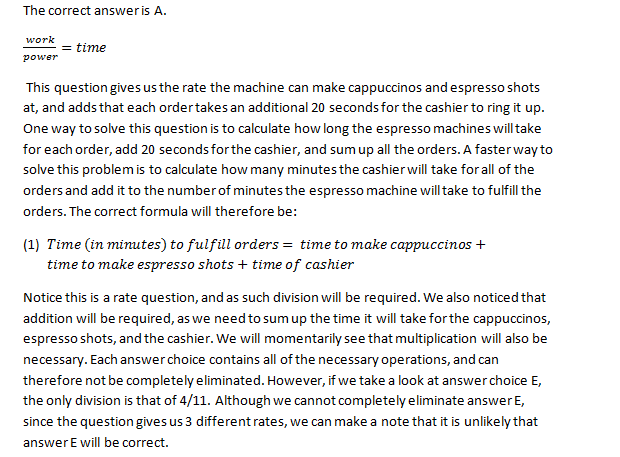 Try using this strategy to solve the following two sample questions. Each figure analogy question consists of eight figures: figures X, Y and Z, and figures 1 to 5. Figure X has been changed in some way to make figure Y. Figure Z has been changed in exactly the same way to make one of the five numbered figures beneath. Explanation: This series alternately multiplies by 3 - divides by 2 to get to the next number. The odd and even terms each increase by *1.5. Therefore the missing number is 18 X 1.5=27. Explanation: In this series the first term is multiplied by 7 to get to the next number in the series. The second term is then multiplied by 5, the third by 3 and so on. If we take a closer look at the pattern: *7, *5, *3, *1 we will notice that the multiplier continuously goes down by 2. Following this pattern, the next multiplier will be 1-2=-1. DOCTOR and TEACHER are both occupations. They can therefore be defined as, "types of occupations." A DOCTOR performs SURGERY. These two words may appear to be similar as they both are related to the field of medicine. However, since they have different relationships to the field of medicine (a doctor practice medicine, while surgery is a type of treatment), it will not be the best answer choice. As it may be confusing to compare the which relationships are stronger, we suggest to try and give a shared definition to both words in a pair to identify the correct answer. Since there is no distinct definition that can be given to DOCTOR and SURGERY, it can be eliminated. A TEACHER teaches in a SCHOOL. Just like DOCTOR- SURGERY, TEACHER – SCHOOL have a strong relationship, however do not have a shared definition as distinct as, "types of occupations." A DESK can be found in a CLASSROOM. Often, if we can take an answer choice and make a short sentence out of the two words as we just did, that answer choice can be eliminated. This is because the two words do have a commonality, however they cannot both be defined in the same manner. DOCTOR or SURGERY for example are not defined as medicine, albeit they are related to the field of medicine. DOCTOR and TEACHER are defined as occupations. Remember though, the fact that a short sentence can be made out of the two words does not mean that there is no common definition of the two words. The sentence rule just helps us indicate distractors which may appear to be correct because of their close association. A TYPEWRITER and PEN can both be defined as, “things which can be used to write.” This is the most distinct and well defined definition that applies to both words in any pair. A KEYBOARD is on a TYPEWRITER. Although these two words have a close relationship, they do not have a shared definition. NEWS - PAPER may appear to be very similar as it is a compound word. However, since there is no distinct definition that can be given to both of these words, it can be eliminated. PEN and PAPER are both used for writing. If we compare this similarity with that of TYPEWRITER - PEN, we will realize that although PEN and PAPER are both used in the writing process, PEN and TYPEWRITER serve the same function in the writing process; A PEN and a TYPEWRITER both contain ink and are used to put ink onto paper. Thus, PEN - TYPEWRITER have a stronger similarity than PEN - PAPER have. The dark triangle becomes white. 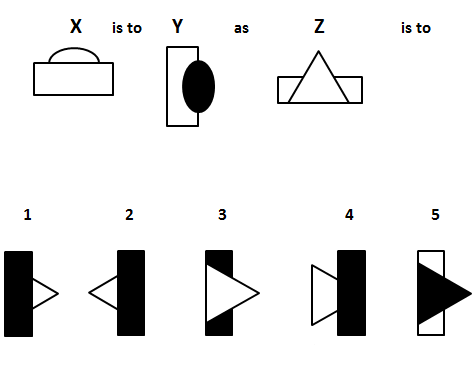 Answers 2, 3 and 4 can be eliminated as they represent the shapes in figure Z in new locations; however, they are not rotations of the entire figure. Answer 5 can be eliminated as it is a 90° counterclockwise rotation of figure Z. We are left with answer 1, which the correct answer, as it portrays figure Z rotated 90° clockwise, while the dark triangle becomes white. The entire figure rotates 90° clockwise. Answers 3 and 5 can be eliminated as the back shape in figure Z (rectangle), did not move to the front. Answer 2 can be eliminated as it shows figure Z rotated 90° counterclockwise. Answer 4 can be eliminated as it shows the triangle and rectangle aligned so that the vertex of the triangle is behind the rectangle. We are left with answer 1, which is the correct answer, as it portrays figure Z with the back shape (rectangle) now in front and dark, while the whole figure is rotated 90° clockwise. Graduate Recruitment Test (GRT) and other trademarks are the property of their respective trademark holders. None of the trademark holders are affiliated with JobTestPrep or this website.